March 19, 2016 By Aileen 9 Comments This post contains affiliate links. As an Amazon Associate and member of other affiliate programs, I earn from qualifying purchases. Now that I’m out of the 1st trimester with my 3rd pregnancy, I thought I would share some home remedies for dealing with the dreaded morning sickness. 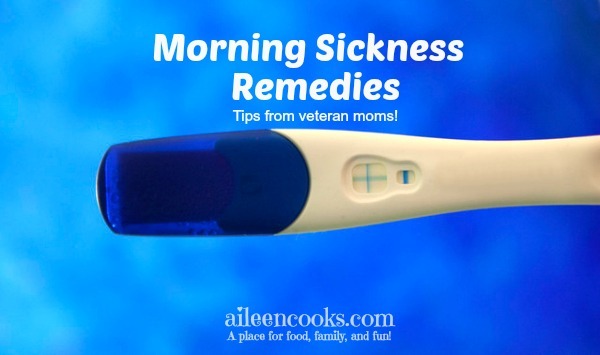 To make sure I bring you the best advice, I gathered morning sickness remedies from veteran moms who have survived morning sickness. Keep crackers by your bed. Eating a little something before even getting out of bed can help curb the empty stomach nausea that plagues many newly pregnant mothers. Eating frequently also helps with morning sickness. Always wear a scarf. Scarves are amazing for quickly covering your mouth when faced with strong aromas that may make morning sickness worse. Krystal at KLG Mom suggests eating small meals or snacks frequently and never letting your stomach get too empty. She said portion control was most important for her to curb the nausea. Noelle at Oh Happy Play says she took magnesium supplements because her morning sickness was so severe. This may be something to discuss with your doctor if you need extra help. Of course, you will want to stock up on ginger ale and saltines! Shannon from Daily Momtivity says what worked for her was to have hard candy with her at all times: jolly ranchers, runts, and mints. Melissa from The Stay at Home Life suggests drinking lots of water, ginger ale or clear soda and having plain, white bread on hand along with saltines. She suggests following the BRAT diet –bananas, rice, apple sauce and dry toast. She says to eat something because not eating only makes you feel worse. Melissa from Beyond Mommying has a great post on Making it Through Morning Sickness. Keep ginger chews in your purse. They are especially helpful when faced with strong smells that make my gag reflex flare up. If you’re especially sensitive to smells, ask your partner to hold off on the after-shave and cologne and take over on garbage duty. Jennifer from Women Winning Online says drinking lots of apple juice and eating carbs for breakfast (think bagels or toast) helped with her morning sickness. She also mentioned drinking pickle juice as a morning sickness remedy if it got especially bad. Brittany from Champagne and Cheerios mentioned that Vitamin B6 really helped with her morning sickness! Emily From Designer to Diapers says sipping on Sprite mixed with water throughout the day helped with her nausea. Several moms suggested preggy pops and sea bands! Jessica from Make and Do Crew suggested eating lots of protein. Her favorite snack was Greek yogurt topped with halved green grapes and walnuts. Yum! Sheryl from Pen on the Edge says: the best advice I have to give is that if your morning sickness becomes severe and you can’t keep any food or liquids down, don’t wait to get help. Get to the doctor right away. You may have an extreme form of morning sickness called Hyperemesis Gravidarum. Have you had morning sickness? What did you do to deal with it? With my first candy helped. I was teaching full time and so, so sick! Something about hard candy like life savers (fruit kind) and jolly ranchers helped! So many great ideas!! I don’t miss those days!! The least little smell could set me off! At least it’s temporary and for a very good cause…… Congratulations, by the way! 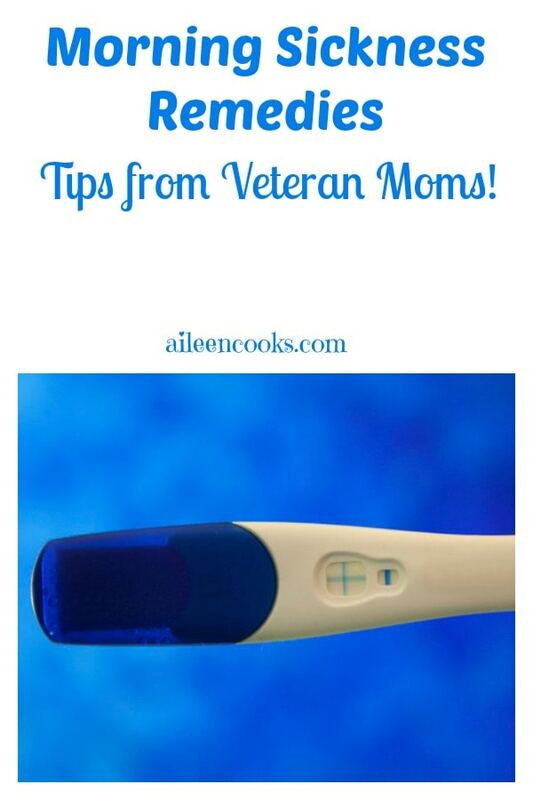 Great tips – and I have to reiterate Sheryl’s: some morning sickness is NOT just morning sickness. If the sickness becomes debilitating and you are vomiting everything you eat or drink, get to a doctor right away. Hyperemesis Gravidarum is a very serious condition that must be closely monitored. Great tips, although I have to agree with what Sheryl said: if the sickness becomes debilitating and you are vomiting everything you eat or drink, get to a doctor right away. Hyperemesis Gravidarum is a serious condition that must be closely monitored – and can lead to emotional side effects as well (depression, etc). I tried a bunch of different prescription drugs. None of them worked as well as no to morning sickness tea. I made sure to steep it at least 5 minutes.. and I actually sipped on it throughout the day. That was the best way to keep my nausea at bay since mine wasn’t just morning sickness. At first I added honey but by day 2 I didn’t need it. I like strong tea so the stronger the better for me. Bethel, I’m glad you found something that worked for you! I’ve never heard of that tea – it sounds like a great option.